In their five year of existence, German act Porta Nigra did release a couple of mini-releases, one full length, and they contributed on one of the Elemental Nightmares splits. Now the duo returns with the second full album, Kaiserschnitt, a Decadent Dark Metal album that lasts for more than three quarters of an hour. And once again the lyrical approach is quite apart, this time based on the pre-war era of the mighty German empire at the beginning of last century – but not to be considered as a tribute to Kaiser Wilhelm II and his crazy crew; on the contrary. 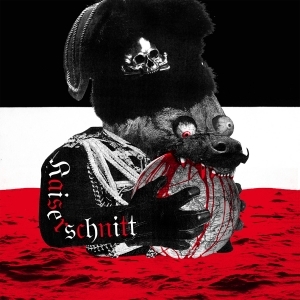 Kaiserschnitt is a superb expression of majestic, megalomaniac and martial Industrial Post-Black Metal with a Black’n’Roll attitude, a progressive execution and lots of avant-garde inspired experiments. The global structures are based on groovy, hammering rhythms and sharp-edged riffs, permanently redefined by atonal, discordant and / or unconventional details. …though ‘details’ is an underrated description for the result isn’t about details only. As a matter of fact, there are so many levels, stylistically and structurally, multi-disciplined and multi-dimensional, confusing the listener’s mind time after time by the eccentric song writing and execution. One cannot blame this duo for lacking inspiration of creativity, neither for lacking variation and craftsmanship!